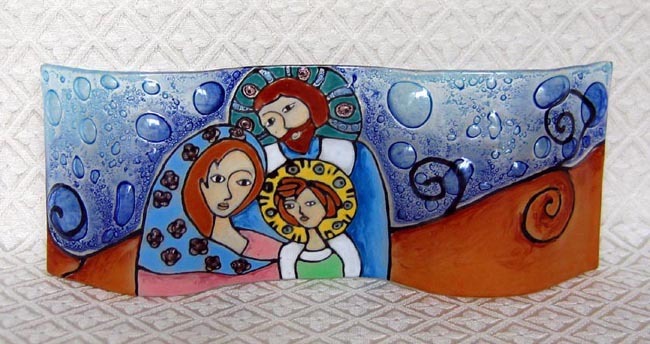 This Nativity scene, created by a team of artisans in Ecuador, depicts a stylized Holy Family. The scene is hand-painted on a rectangular sheet of glass, then stacked with thin sheets of glass. The stack is placed inside a kiln and then heated through a series of ramps (rapid heating cycles) and soaks (holding the temperature at a specific point) until the separate pieces begin to bond together, softening and rounding the edges of the original shape. This strong fused glass has a uniquely bubbled surface. While the colors remain consistent when fired, the bubbling pattern is entirely unique for each piece. The hot glass is bent into a wave shape so that it will stand without support. The scene measures 10 inches long by 4 inches tall.